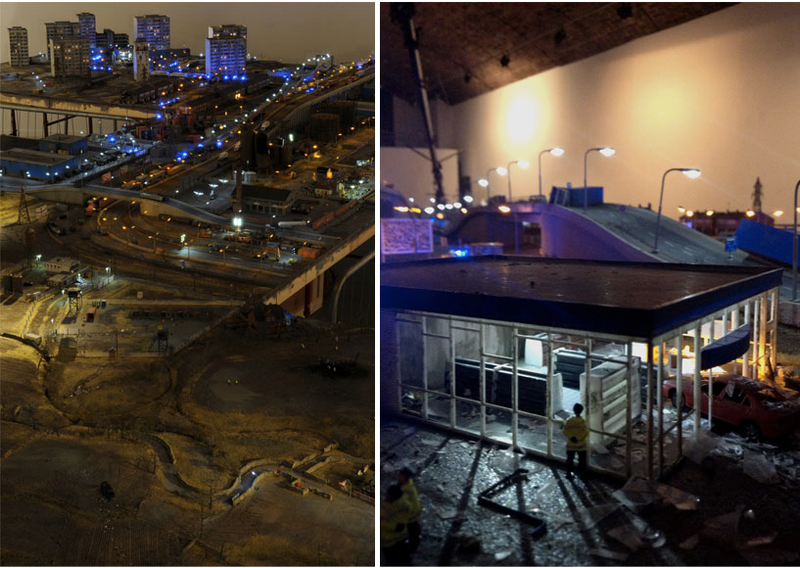 British artist/musician Jimmy Cauty, who has worked previously with The Orb and The KLF, has created an incredible model of London after a horrific disaster — in the style of a miniature train set. It's a haunting portrait of the city after it's been torn apart by riots and violence. We aren't sure what's happened, but it appears that London has been taken over by police who have just quelled a massive uprising in the city's decaying infrastructure. Cauty apparently started by making a beautiful model of the city, complete with functioning lights, and then smashed it up to create the eerie apocalyptic effect. A miniature post-apocalyptic world, burned, looted and devoid of all human life apart from a swell of police make up british artist james cauty’s ‘the aftermath dislocation principle part I’. the construction is a vast 1:87 scale model detailing the a desolate, charred aftermath of what appears to have been a crazed riot in london. the only visible populace are the 5,000 or so police at the scene armed with vans and weapons ready to control and quell. the whole scene is set into motion for the exhibition, as ambulance and street lights strobe in the darkness . . . the artwork is a product of months of labor intensive work, building the model using traditional techniques. after its completion, he shattered, smashed, and broke the construction to emulate a destructive scene. The installation was on display at l-13 Light Industrial Workshop, London.